Place one chicken breast on a board. Place 3 fresh sage leaves on top of chicken breast (or sprinkle with poultry seasoning). Place one slice of prosciutto on top. Secure with toothpicks. Heat olive oil in fry pan. Lightly dredge both sides of chicken. Brown 3-4 minutes on each side. Place on a sheet and put into a 400 degree oven for about 6-7 minutes, or until done. In a hot pan, place 1/4 cup fresh lemon juice and 1/2 cup chicken broth. Reduce by half. Add 1/4 generous cup of heavy cream. Reduce by half. Add 8 tbsps butter in pieces and stir to incorporate. Cook until lightly thickened. Remove from heat and add 1/3 cup capers, 1/4 cup chopped sundried tomatoes and one 14 oz. can of artichoke hearts, sliced in half. Remove chicken from oven and put one piece on a plate. Enrobe with some of the sauce. Serve with a salad, some rice, some noodles or whatever you like! Yum!!! Brown the sausage and chop it up. Mix cooled sausage and cheeses and set aside. In a mixer bowl, put in 6 cups of flour. Add the yeast. Mix on low until well combined. Let rest about 5 minutes. Remove and transfer to a lightly oiled bowl. Cover and let rise for about an hour. After dough has risen, punch down and turn out onto a floured board. Cut dough in half. Using 1/2 at a time, roll out to a large triangle about 1/4″ thick. Top with half of the sausage mixture, spreading it out. Starting at a short end, begin rollilng up the dough, pinching ends tightly as you go along. 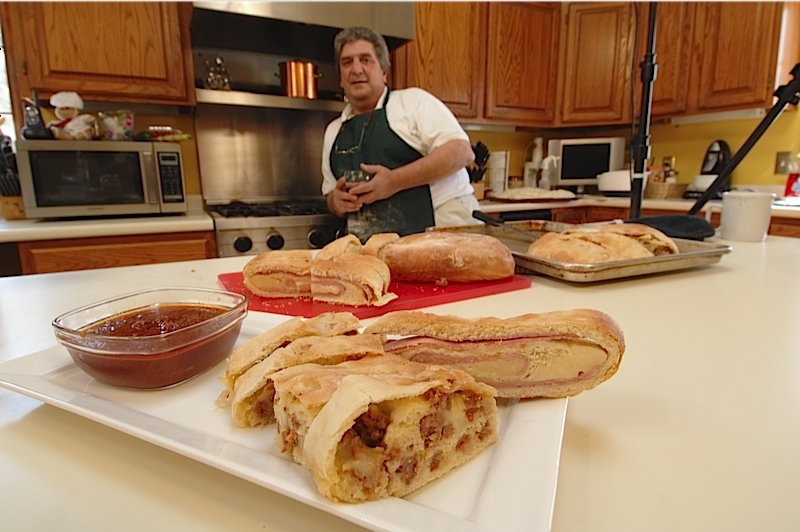 When all rolled up, cut off excess dough from sides, place on a lightly oiled sheet and let rise for about an hour. Heat the oven to 450 degrees. Bake the loaves for about 25 minutes. Lower the temperature to 250 degrees and continue baking for another 15-20 or when browned and they “thump” when you tap them. 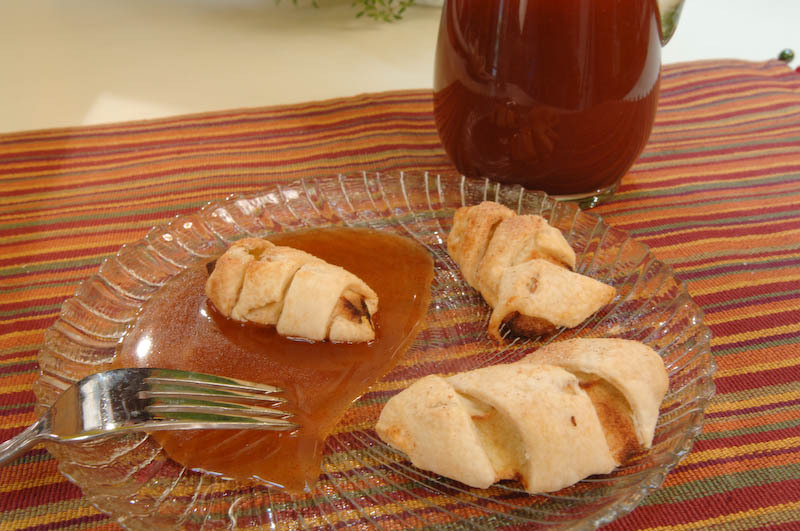 Serve hot or cold with our favorite tomato sauce for dipping. In a medium saucepan, heat butter until melted but not browned. Add flour and stir until smooth. Over medium heat, cook until golden brown, about 6 to 7 minutes. Meanwhile, heat milk in separate pan until just about to boil. Add milk to butter mixture 1 cup at a time, whisking continuously until very smooth and bring to a boil. Cook 10 minutes and remove from heat. Season with salt and set aside. Put noodles in large , flat pan so that they lay flat. Pour boiling water over. Drain the noodles from the hot water and dry with a clean towel. Spread a bit of mixture on top of each noodle and roll up the long way.Pour red sauce , homemade or jarred, in bottom of a baking dish. Arranged stuffed rolls seam side down and not touching in the pan. Top with more red sauce. Cover and bake 35 minutes or until bubbly. 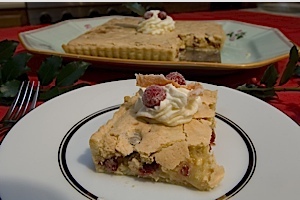 To make ahead-Finish recipe but do not bake. Cover with plastic wrap and refrigerate up to 24 hours or freeze up to 2 months. Taking from refrigerator remove plastic and cover with aluminum, foil and bake 1 hour. Taking from freezer, remove from freezer and bake 2 hours. Mix sugar and cinnamon. Pour onto apples. Add rum and mix well. Cover and refrigerate 1 hours. Mix flour, salt, yolks, milk, beer and butter until smooth. Cover and refrigerate 1 hour. When ready, beat eggs whites until stiff and add to batter. Drain liquid from apples and add that to the batter. 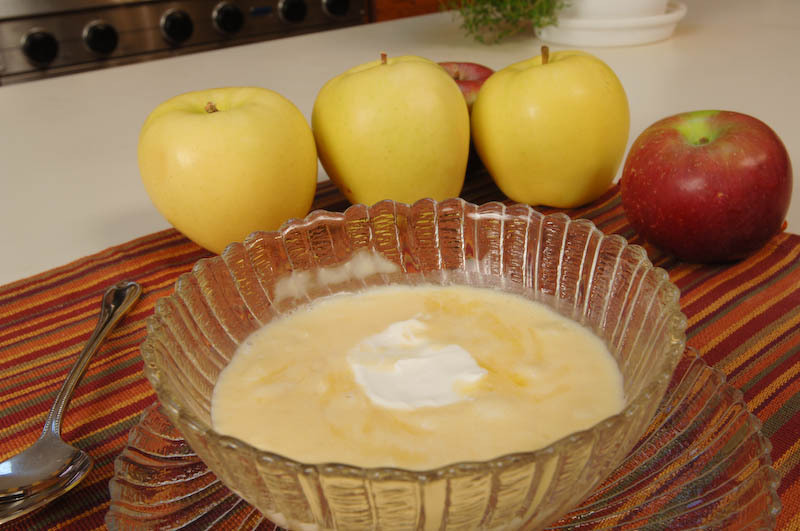 Oil at 375 – dip apples into batter and then drop into oil. Cook until brown on both sides. Drain. Combine all ingredients in saucepan. Stir over low heat until cheese melts. Blend in electric blender or hand-handle immersion blender until smooth. Serve hot with a dollop of sour cream and additional grated cheese. and season with salt and pepper. Spread the curry mayo on the bread slices. For each sandwich, place apple slices on 1 slice of the bread and top with another slice. Cut into desired shapes and serve at once. NOTE: This would be great if the bread were toasted or grilled with cheddar cheese. 4 hours ahead, covered and refrigerated. golden brown, about 10 minutes. Set aside. skillet and saute until just cooked through, about 2 minutes per side. Transfer to a plate and keep warm. sauce consistency, about 3 minutes. Season with salt and pepper. 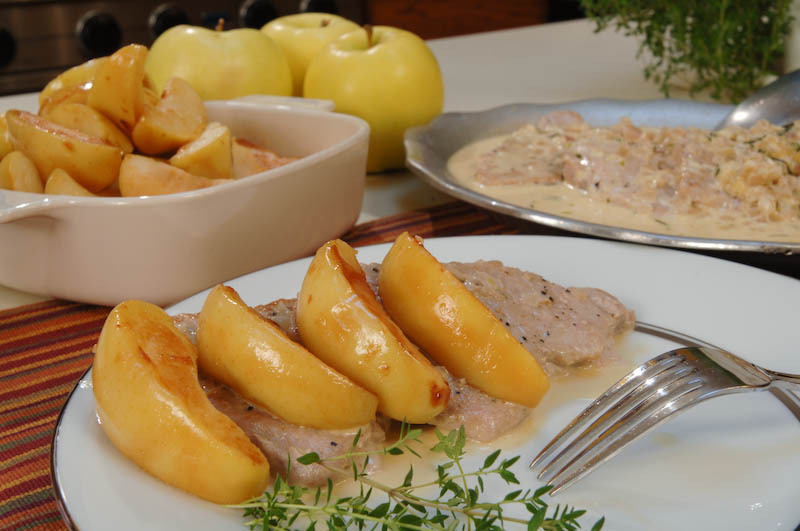 Place pork on a large platter, spoon sauce over and arrange apples around the meat and serve. Instead of making your own pastry, you can buy refrigerated pie crust. Heat oven to 425. Cut each apple into 8 edges. mixing lightly with a fork until dough is just moist enough to hold together. Shape into a ball. On a floured surface, roll dough lightly from center to edge into 12″ square. 16 (10″) strips. Wrap 1 strip around each apple wedge. Place 1/2″ apart on an ungreased pan. Brush each wrap with melted butter. In small bowl, blend sugar and cinnamon. Sprinkle over the wraps. Bake at 425 for approx. 20 minutes or until golden brown. In a saucepan combine sugar, cornstarch, cinnamon, cider and lemon juice. Bring mixture to a boil. Remove the pan from the heat and add the butter. You will need one cedar plank, soaked in water for four or more hours. Mix all of the above well in a bowl and set aside. With some olive oil, oil the plank, spreading it around. Mound onion/tomato mixture on top of the plank, spreading it out evenly. Lay the shrimp on top of the onion/tomato mixture. Put plank on the med-high grill and grill 8-10 minutes until shrimp is done. Blend the butter in, putting in a few pieces at a time and whisking until well incorporated. Combine the strawberries, sugar and 1/4 cup of water in a medium saucepan and cook uncovered over medium-low heat fro 5 minutes. Add 2 half-pints of raspberries and all the blueberries and cook, stirring occasionally, until the mixture reaches a simmer. Cook for one minute. Off heat, stir in the remaining raspberries, framboise and the teaspoon of fresh lemon juice. Spoon fruit into a sieve set over a bowl and let drain 15 minutes. Cut bread into 1/2-inch thick slices. Line of the of your bowl with one slice, cut to fit if needed. Line the side of the bowl with all but one or two slices, overlapping them slightly. Spoon the drained fruit into the bread-lined bowl (reserve juices) and cover completely with remaining bread, cut to fit if needed. Pour reserved juices evenly over the bread, making sure all bread is saturated. Cover pudding directly with a piece of plastic wrap and find a plate approximately the same diameter and the top of the bowl and place it on top so it sits on the wrap over the pudding. Weight the plate with a heavy can and refrigerate. Remove the weight after 6 to 8 hours. Cover the pudding with plastic warp and refrigerate overnight. Pam’s Note: Pudding can be chilled (with weights) up to 3 days. Place beans in saucepan and cover with water; bring to a boil. Cook, uncovered, for 8 minutes or until crisp-tender. Meanwhile, in a skillet or microwave, cook bacon until partially cooked, about 3 minutes; drain on paper towels. Drain beans; place about 12 beans on each bacon strip. Position on end of beans so they are nearly even; cut about Ã‚Â¼ inch from that end so stalks will stand when served. Wrap bacon strip around beans, secure with a toothpick. Lay stalks flat on ungreased baking sheet. Sprinkle with onion powder. Bake, uncovered, at 400 degrees for 10-15 minutes or until bacon is crisp. 6 servings. Dip slices into egg, then into bread. Place in ungreased 13x9x2 pan. Drizzle with butter. Bake uncovered 30-35 minutes or untils squash is tender. Mix all of these in a bowl until well blended. Add 1/2 cup flour and blend well with a whisk. Pour into pie crust and bake at 350 for 50-55 minutes until top is crusty and deep golden brown and knife inserted in center comes out clean. Top with a dollop of whipped cream and a little cinnamon and candied orange peel. Tart can be made 2 days ahead. 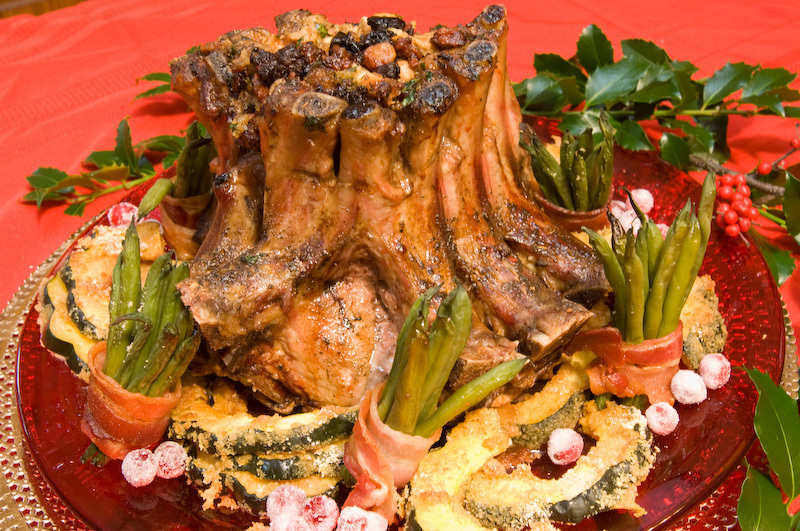 Tie roast and place on a rack in a large roasting pan. Cover the bone ends with foil. Insert meat thermometer. Roast at 350 degrees for 2 hours. Meanwhile, in a large skillet, cook the pork and pork sausage until browned; drain and set aside. In the same skillet, sautÃƒÂ© onion in butter until tender. Add apple and celery; cook for 5 minutes. Remove from heat. Add the cooked pork and sausage, crumbs, parsley, salt, pepper and sage; mix well. Remove roast from oven. Carefully press a double layer of heavy-duty foil into the center of roast to form a base for stuffing. Spoon stuffing lightly into crown. Return to oven and bake for 1 hour more or until a meat thermometer reads 160-170 degrees. Transfer to serving platter. Garnish with spiced crab apples if desired. Cut between ribs to serve. Cover and refrigerate the mixture 8 hours or overnight. cookie sheet and let stand at room temperature for a few hours to dry. Mix together well, cover and refrigerate at least 15 minutes. 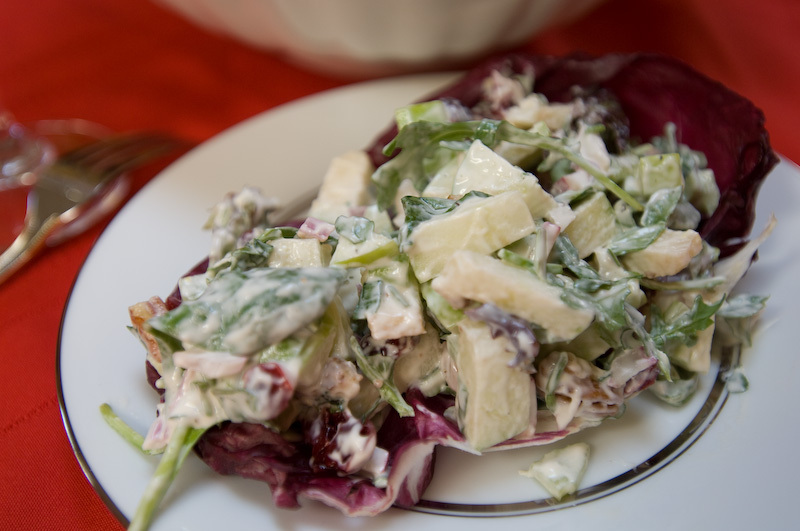 Mix apples, celery, onions, radishes, cranberries and pecans. Toss with mayo mixture. Put mixture on top of greens and toss. Serve in a radicchio cup.